Fall is in just around the corner, but there is still plenty of summer fun left to be had. There are also lots of deals and closeouts on outdoor furniture to be had right now. 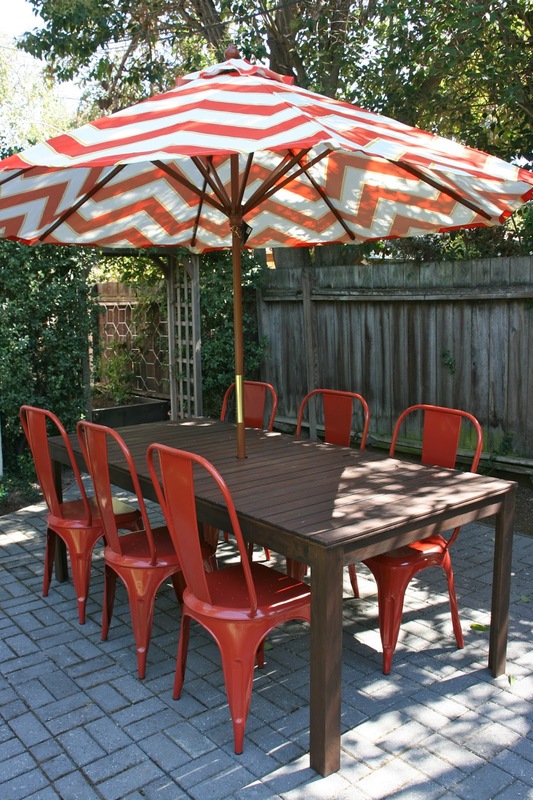 So when World Market heavily discounted all their outdoor furniture recently, daughter Melissa and I loaded up the truck with a new table, eight orange Tolix "wannabe" chairs and an orange chevron striped umbrella for her patio. She got a whole new look for an incredible price! She had her eye on some wooden chairs at first, but I talked her into the orange metal chairs. After all, she loves orange! I think they look great with the umbrella. So young, fresh and playful! With just a short walk out the back door and across the lawn to the patio, her family can be enjoying many an alfresco meal before fall arrives. If you are looking for a bargain on outdoor furniture to spruce up your patio, now's the time! Charming! 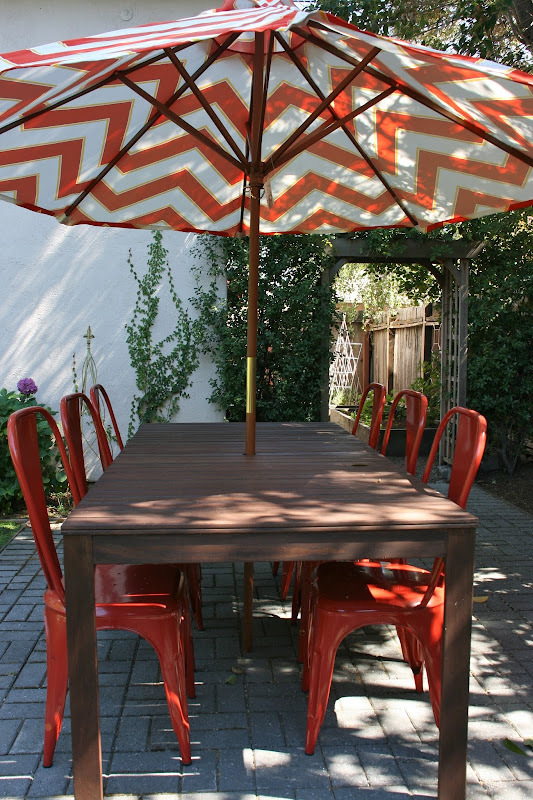 Love the orange and white stripe umbrella and the chairs for an alfresco setting. Looks like a perfect spot to enjoy meals and leisure time. Love the chairs and that umbrella is so fun! I can just imagine the dinners there. Timeless, easy to move ( as opposed to some wooden chairs) and just plain cute! great choices! love it all, and their patio is wonderful!! Hi Delores, Christine here from Little Brags...just wanted to let you know that I blogged about some DINING Room plans and I used one of your pictures as inspiration (with a link back to your blog). Hope that was ok....I love your style. Here is the link if you want to take a look. 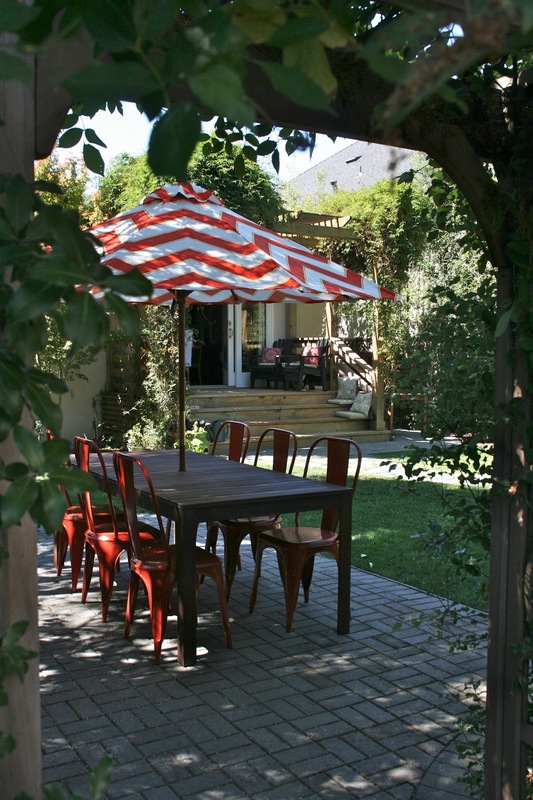 Love the orange chairs and umbrellas - sure does brighten up the space. So cheerful! This furniture is looking awesome. I am running one hotel and resort near the main city and I was searching a good furniture shop for my hotel, resort. Very nice outdoor wood furniture. Any idea if it's made from teak? I love the bright colors you choose! The chevron pattern on the umbrella is so cute, and the bright orange really makes it pop. The chairs are so cute! Did you get them like that, or did you paint them yourself? Either way, they look darling!